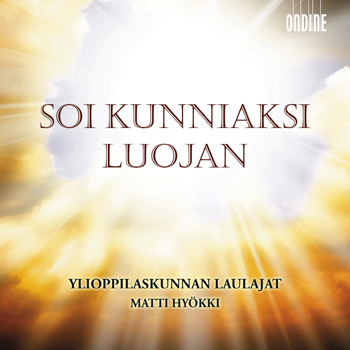 This CD features the Finnish YL Male Voice Choir, one of the world's most prominent male choirs. Under Matti Hyökki, their conductor for 30 glorious years (1980-2010), they perform 17 religious hymns that strike a chord within every true Finn’s heart. The representative selection taken from the 1986 hymnal is completed with the popular Armolaulu ("The Grace") by Kari Tikka and Suojelusenkeli ("Guardian Angel") by P.J. Hannikainen. All musical arrangements, written for YL, showcase the Choir’s exceptional vocal accomplishments. Since its foundation at the Helsinki University in 1883, YL has continued to champion Finnish choral music, including numerous works written for this choir by Jean Sibelius and Einojuhani Rautavaara. YL's long history of acclaimed performances and award-winning recordings includes such orchestras as the Los Angeles Philharmonic, Bournemouth Symphony, and Helsinki Philharmonic Orchestra, and such conductors as Esa-Pekka Salonen, Osmo Vänskä, Leif Segerstam, and Paavo Berglund.